February 15, 2016  Earlier research found that people in a messy work area were less likely to choose healthy snacks. 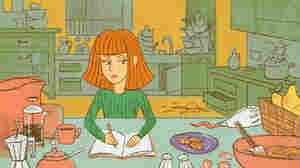 Now a study hints that a cluttered kitchen might make those who feel out of control eat more sweets. October 7, 2013  Psychology and culture play significant roles in determining what food we rate as desirable and what food makes us cringe in disgust. Commentator Tania Lombrozo traces her own path from omnivore to vegan and confesses that she has lately been greedily eyeing food that most people would rather just pass on by.